Dr. William White displays storage of a large ray specimen to Dr. Ralph Mana at the CSIRO Australian National Fish Collection in Hobart, Tasmania. 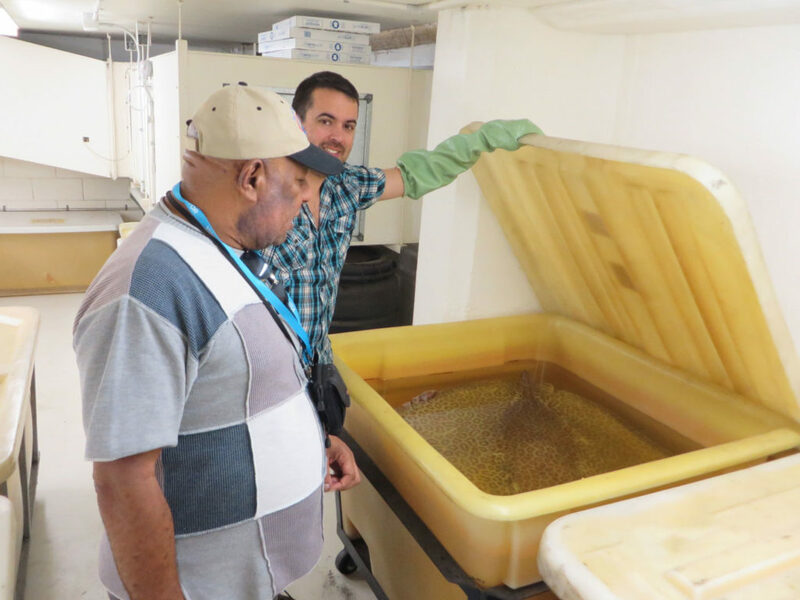 Following on from earlier training, a recent in-country workshop in Australia gave two fish scientists from the University of Papua New Guinea, Port Moresby, hands on experience with leading experts at CSIRO and James Cook University (JCU). Senior Lecturer at the School of Natural Science, Dr. Ralph Mana, and his student, William Tamarua, visited the CSIRO Australian National Fish Collection in Hobart, where they were treated to the largest shark and ray collection in the southern Hemisphere. They were given demonstrations and technical training on preparing, storing and studying chondrichthyan fish (sharks, rays, skates and sawfish). Dr. Mana and Mr. Tamarua were shown the importance of properly maintaining a fish collection, and the future benefits in having good quality specimens. “Being able to show fellow scientists how to collect biological data, curate specimens, age fish, etc., in a world-class laboratory with equipment not accessible in many countries has many benefits,” explains Dr. William White of CSIRO. They were instructed on the process of using x-ray and high-definition photography to make taxonomic work more convincing, and to create 3D printed models for scientific study and training. The tour of the molecular laboratory showcased how specimens are prepared and their genomes sequenced, explaining the different stages of barcoding biological tissue samples. Following the training in Hobart, the pair flew to Townsville to learn more about catching, processing and studying sharks. Hands-on training was provided by researchers at James Cook University on the best practices for preparing and observing vertebrae under a microscope to study ageing and other factors. A standout of the visit to JCU was the Great Barrier Reef Aquarium – the largest living coral reef aquarium – demonstrating the water filtration system, coral growth garden, and wide array of tropical fish. “All in all, what I was exposed to was more than I expected. The several days I spent at Hobart and Townsville was truly educational and enlightening particularly in sharks research and conservation work. It provides a new stepping stone for me to continue the cooperation I have established with William and Andrew,” concluded Mana. The in-country workshop is furthering the work of a large-scale ACIAR project on Papua New Guinea’s shark fisheries, which aims to improve capacity of ecological, socioeconomic and stock assessment aspects of fisheries management. Special thanks to Dr. William White, Dr. Sharon Appleyard, Dr. Campbell Davies and Dr. Jessica Farley of the CSIRO Australian National Fish Collection, as well as Dr. Andrew Chin of James Cook University (JCU). At our recent Doing Well by Doing Good Forum in Hobart, a presentation was given on the range of training that the Fund’s Tasmanian Committee has supported around capacity development in fisheries.